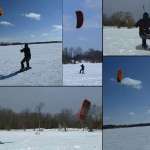 Snowkiting is a fun and exciting sport performed during snow season. 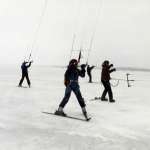 Snowkiting is a combination of kite-flying skills with snowboarding or skiing over mountains, frozen lakes and snow covered fields. At CKSS kitesurfing school, we promote safety and follow the rules and regulations, local and international standards. You can get into the sport quickly and safely while having fun by selecting a professional instructor at CKSS. All of our instructors are certified and follow single unique CKSS kite boarding school method of teaching. For the lesson we will provide you with all kiting equipment needed.